After hundreds of people were arrested and injured during Saturdays’ Yellow Vest protests, government is now mulling all options as a response. That includes a state of emergency, a spokesman confirmed. “It is out of the question that each weekend becomes a meeting or ritual for violence,” a government spokesman, Benjamin Griveaux, told Europe 1 radio on Sunday. 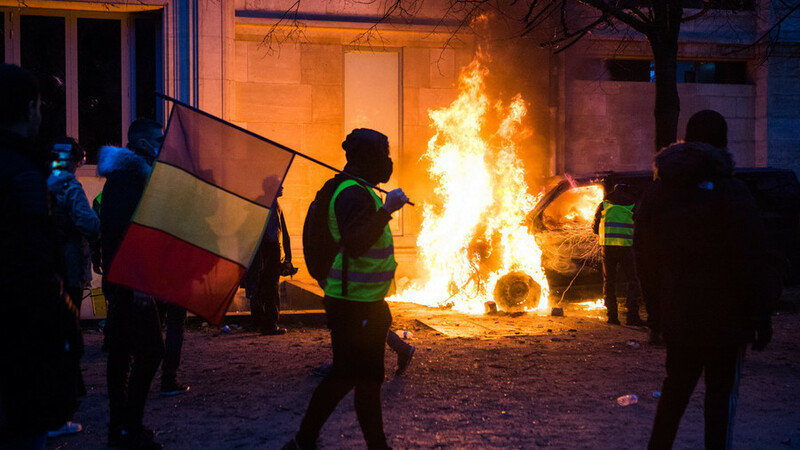 The Elysee Palace condemned the violence but said that the government was ready to talk with the protesters over the planned fuel hike and higher taxes, which triggered the unrest. President Emmanuel Macron asked Prime Minister Edouard Philippe to hold talks with political parties and protest leaders. However, Paris is also apparently determined to keep its current reform plan. “We won't change course. We are certain of that,” Griveaux said, hinting that the government was considering an imposition of a state of emergency over the protests. Griveaux’s comments were in response to a question about the possibility of imposing a state of emergency in order to prevent further violence. The spokesperson also gave his take ahead of a special meeting between President Emmanuel Macron as well as his prime minister and interior minister. 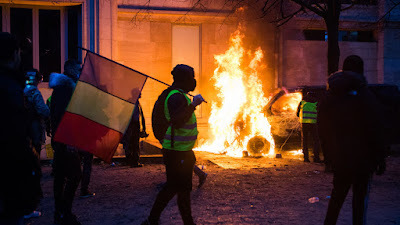 Dubbed the Yellow Vest movement, the protests have been occurring weekly since November 17 and get their name from the fluorescent jackets French motorists are required to keep in their car in case of emergencies. Starting with last weekend, the rallies peaked into major clashes between police and protesters. The violence essentially reached levels unseen in decades in France. A protest in the capital on November 24 quickly descended into chaos with the city’s streets later resembling a ‘warzone’, with burned trash bins, cars and smashed windows. The mayhem escalated further this Saturday as running street battles between groups of demonstrators and riot police flared up again, with much of the action centered around the iconic Arc de Triomphe. Police made 412 arrests in connection with the latest unrest. More than 130 people were injured, including 23 law enforcement members. Not ruling out a state of emergency late on Saturday night either, Interior Minister Christophe Castaner told BFM TV he had “no taboo” over the measures. Castaner believes “casseurs” (agitators) and those from both left- and right-wing fringe groups were responsible for egging on many of those caught up in the rioting. While pinning the blame on the said agitators, police were unapologetic about its way of dealing with the demonstrators. The heavy-handed tactics included firing volleys of tear gas and water cannons at protestors from close range. One protester was filmed with a bloodied face, presumably caused by such a hit. Several RT reporters also got into crosshairs of police response. RT France’s Lucas Leger was left with a bloodied face after a tear gas canister exploded right next to him. While RT International journalist Peter Oliver was also injured when he was hit in the ankle by a rubber bullet fired from a police gun.